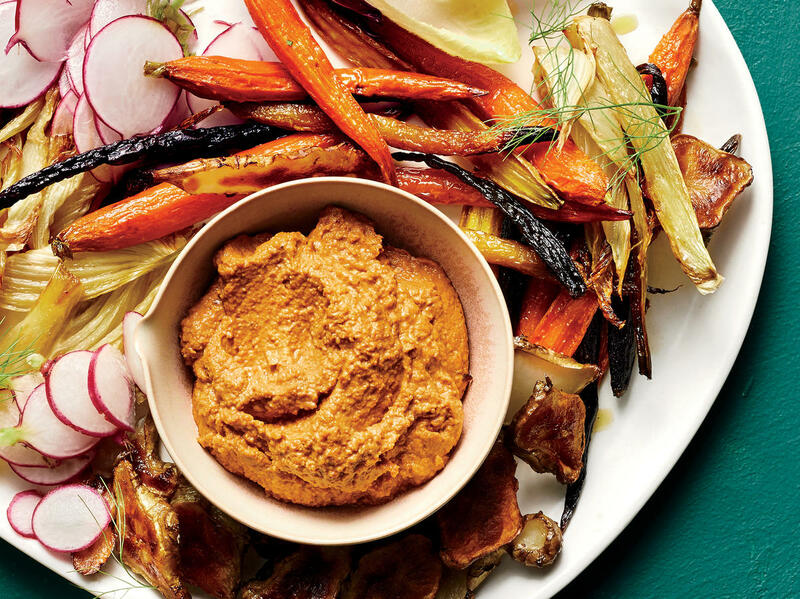 Romesco is a Catalonian sauce made from tomatoes and nuts—and it makes a delicious pre-meal appetizer or snack with veggies! It pairs beautifully with harissa-spiked hummus. Make this romesco as smooth or chunky as you like—and up to three days ahead. Use leftovers as a sandwich spread or sauce to top meat or pasta. Sunchokes are sometimes labeled as Jerusalem artichokes. If you can’t find them, sub fingerling potatoes. Prepare the romesco: Preheat oven to 325°F with oven rack in middle of oven. Spread hazelnuts and bread in an even layer on a rimmed baking sheet. Bake at 325°F until hazelnuts are toasted and bread is slightly dried, about 8 minutes. Using a towel, rub off hazelnut skins. Set aside hazelnuts and bread. Turn on broiler to high with oven rack in top third of oven. Place bell peppers on a rimmed baking sheet. Broil, turning occasionally, until charred, about 14 minutes. Set oven temperature to 425°F. Transfer peppers to a bowl. Cover tightly with plastic wrap, and let stand 10 minutes. Peel, stem, and seed bell peppers. Tear toasted bread into small pieces; place in a food processor. Add toasted hazelnuts, almonds, and garlic; process until finely chopped, about 20 seconds. Add charred bell peppers, sun-dried tomatoes, oil, vinegar, paprika, salt, and cayenne. Process until almost smooth, about 30 seconds. Set aside. Prepare the fresh and roasted vegetables: Toss together sunchokes, half of fennel, half of carrots, oil, and salt on a rimmed baking sheet. Roast at 425°F until tender, 30 to 35 minutes. Spoon romesco into a serving bowl. Serve with roasted vegetable mixture, radish slices, endive leaves, and remaining fresh fennel and carrots.